This topic contains 4 replies, has 2 voices, and was last updated by Billy 4 years, 5 months ago. This Entertainments cutting was taken from Page 2 of the Express and Star, as you can see many years ago. 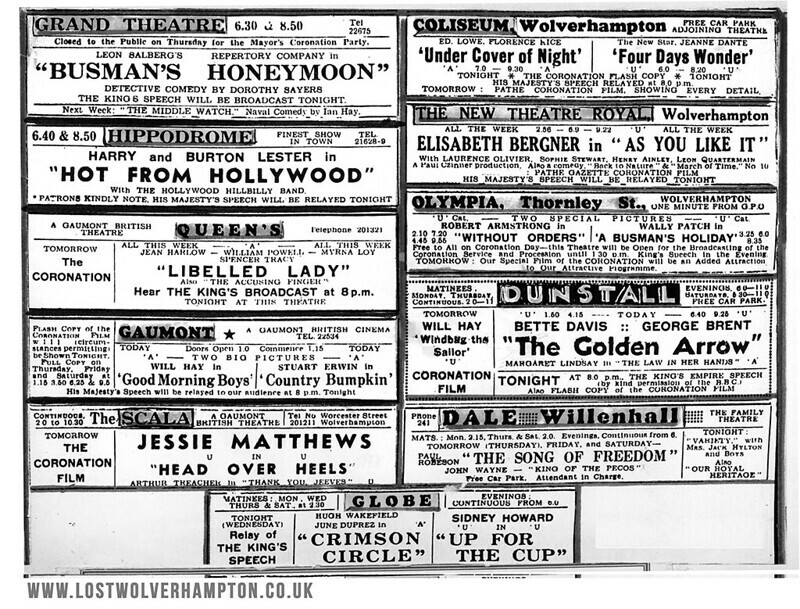 From the clues in the cutting..
(1) Can you date the month and year it appeared in the paper..
(2) There are Eleven entertainment venues advertised here.Which one would you say is the odd one out..
Well, Head over Heels with Jessie Matthews was released in America in February 1937 and the King’s speech, alluded to in some of the adverts, took place on the 12th May in that year, so I’d guess at May 1937 for the date. Odd one out? The Dale seems to be the only one outside Wolverhampton, but knowing how devious Billy’s questions can be, I suspect that’s too easy! Spot on with the first answer Tony The Date was the 12th May 1937. The broadcast of the Kings Speech to be relayed to the Theatres and Picture houses across the town. Followed by a Pathe Newsreel of the Coronation of George VI and Queen Elizabeth to be shown next evening at selected picture houses. I’ll go for the Grand Theatre, the only one still operational. All the others have been demolished or have changed use. Yes Tony that is a good enough reason for picking the “Grand Theatre” Which is indeed the write answer. But my reason was a little more subtle, Out of the eleven venues eight of them were built especially to show Films. But the “Grand Theatre”, “The New Theatre Royal” and the “Hippodrome” were built initally as Theatres’. But on the 15th June 1931 The New Theatre Royal initially a Variety and Music Hall, became a cinema and in 1948 changed its name to the “Clifton”. The “Hippodrome” Music Hall opened on the February 21st 1921 on the site of the old “Empire” Theatre in Queen Square.and many great names from the world of live entertainment appeared there till it unfortunately caught fire and was demolited in February 1956. In 1931 though the “Hippodrome” had a short 12 month career as a cinema , showing films as the “Agricultural Hall” on Snow Hill was demolited to make way for the building of Wolverhampton’s first Super Cinema “The Gaumont”. So the answer I hoped someone might come up with was The “Grand Theatre” because it was the only one of the eleven venues that never showed films.